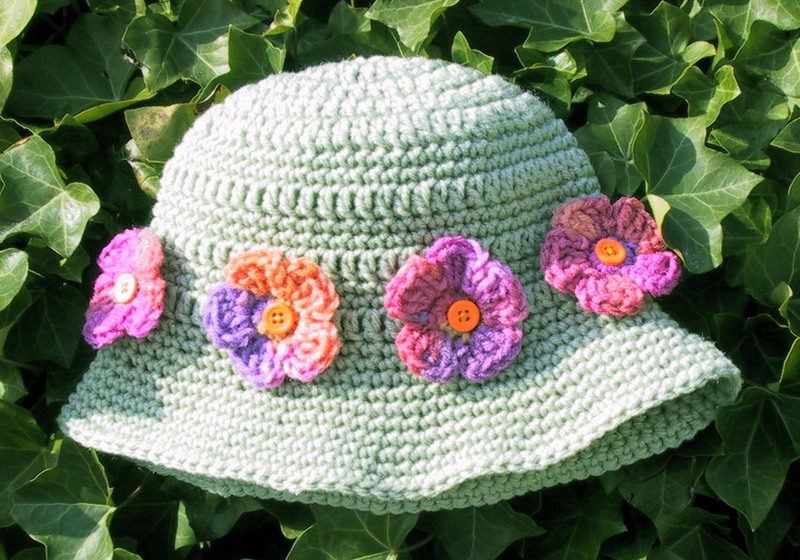 Read about the May Flowers Hat Contest here. The winning hat can be seen HERE. 3. Flowers maybe either sewn to hat or glued. I like to sew them using a button for the center and embroidery floss for thread. It is best to sew the leaves on first and then top with your flowers. I sew on the leaves with a running stitch through the center of the leaf. Ch 4, join with a slipstitch to form a ring. Round 1: Ch 1, 9 sc in ring, working over tail at the same time.. Join with slipstitch in first sc. Use the tapestry needle to join end in first slipstitch. Leaving a 6 inch tail for sewing, ch 22. Work the following sts one in each ch. Slipstitch in 2nd st from hook, sc, hdc, 4 dc, hdc, sc, slipstitch in 3 ch, sc, hdc, 4 dc, hdc, sc, slipstitch. Now work in the unused loops of ch, one st in each ch. Slipstitch in same st as last slipstitch, sc, hdc, 4 dc, hdc, sc, slipstitch in 3 chs, sc, hdc, 4 dc, hdc, sc, slipstitch. 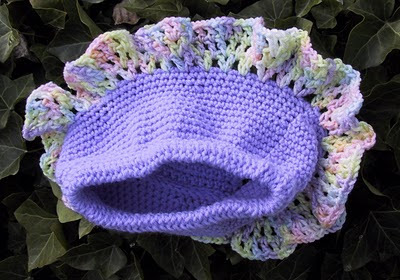 Do not join, fasten off and use your tapestry needle to finish off the end of leaf. Ch 11. Work the following sts one in each ch. Slipstitch in 2nd st from hook, sc, hdc, 4 dc, hdc, sc, slipstitch. Now work in the unused loops of ch, one st in each ch. Slipstitch in same st as last slipstitch, sc, hdc, 4 dc, hdc, sc, slipstitch. Do not join, fasten off and use your tapestry needle to finish off the end of leaf. 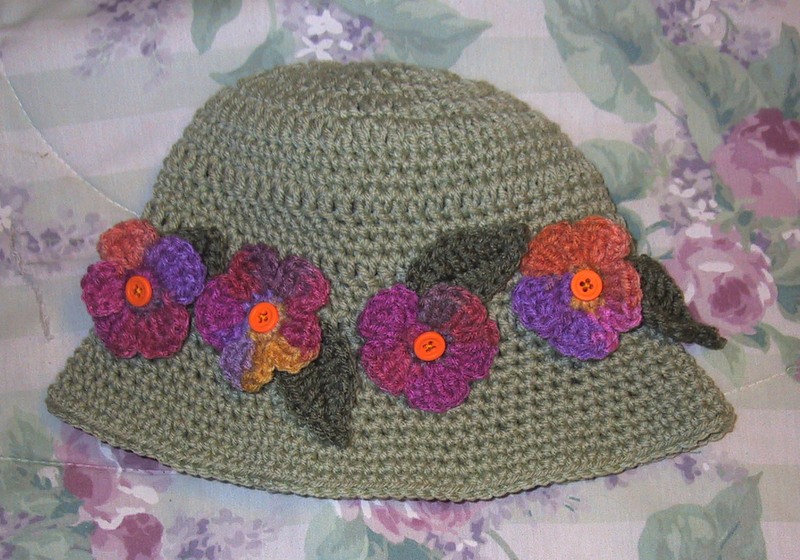 Attach leaves and flowers around hat centering on round 14 or 15 for larger size. Vanessa's Girly Diaper Cover crocheted of Simply Soft Baby Brites Ombre. 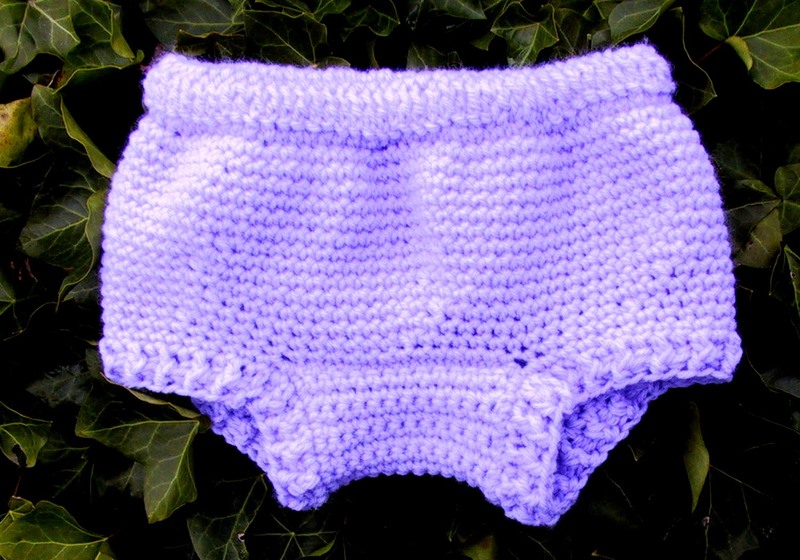 Girly Diaper Cover crocheted of Pound of Love lavender and Simply Soft Baby Brites Ombre. Here's a good video to show you how to do the Dc Foundation Stitch. Scdec = Insert hook in next st, draw up a loop, (two loops on hook), insert hook in next st, draw up a loop (3 loops on hook), YO and draw through all 3 lps. Shell = Dc, ch 1, dc. 2. 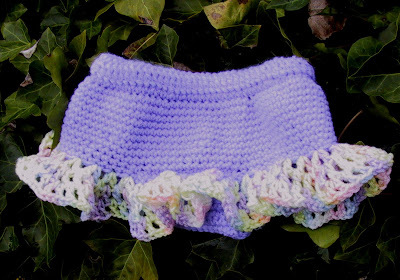 Diaper covers in photo crocheted with Lion Brand Pound of Love Lavender and Simply Soft Baby Brites Ombre. 4. To make the waistband adjustable, cut the elastic 2 inches shorter and sew about 8 inches of twill tape or ribbon to each end. Then crochet over the elastic, but leave the tape or ribbon ends loose at about the 28th stitch. Then you can tie the ends in a bow. 5. When working round 2 of ruffle, don’t worry if you end up with one more or fewer than 39 shells. Before beginning prepare the 16 inch elastic by over lapping the ends by ½ inch and sewing securely. Round 3: Drop the loop from your hook, hold the elastic against your first dc row. Fold the bottom dc row around the elastic. Insert your hook through the loop that is in front of your joining loop from the previous round, pick up the dropped loop and pull it through. Ch 1, sc through both layers matching the loops around, enclosing the elastic Join with a slipstitch in first sc. Turn work inside out, drop loop from hook. 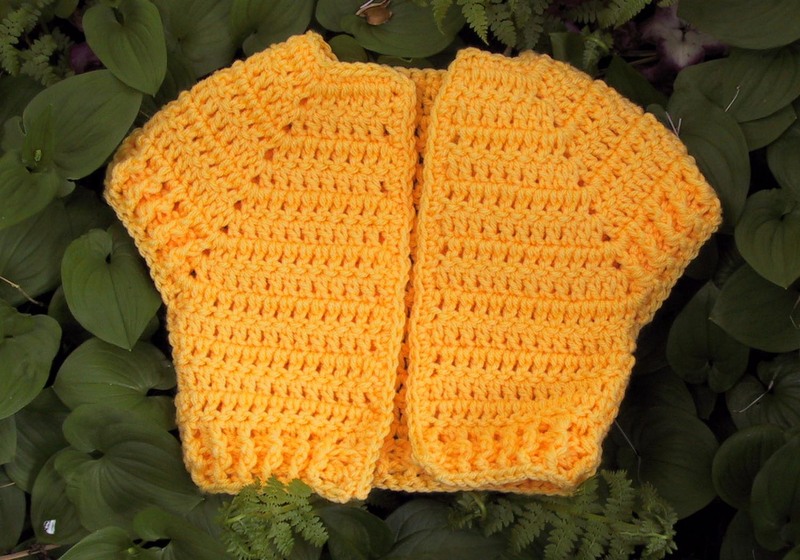 You are now going to match the row you just finished to round 13, skip 17 sts. Insert hook in 18th st and pull the dropped loop through. Ch 1 and slipstitch through both layers to the end of the row. Round 3: Ch 4, *shell in ch 1 sp, ch 1, dc between shells, ch 1. Repeat from * around. Join with a slipstitch in 3rd ch of ch 4. Round 4: Ch 4, dc between next 2 sts, *shell in shell, (ch 1, dc between next 2 sts) twice, ch 1. Repeat from * around. End with shell in shell. Join with a slipstitch in 3rd ch of ch 4. LEFT LEG: Work the same as right leg. Weave all loose ends in using the tapestry needle. Before beginning prepare the 18 inch elastic by over lapping the ends by ½ inch and sewing securely. Turn work inside out, drop loop from hook. You are now going to match the row you just finished to round 17, skip 17 sts. Insert hook in 18th st and pull the dropped loop through. Ch 1 and slipstitch through both layers to the end of the row. Thanks to Vanessa for testing this pattern. Sc Dec: = Insert hook in next st, draw up a lp, (two lps on hk), insert hook in next st, draw up a lp (3 lps on hook), YO and draw through all 3 lps. sc in 6 sts, sc dec over next 2 sts, sc in last 4 sts. Ch 1, sc in same st, 29 sc down the left front. Here's a good video to show how to do the Dc Foundation Stitch. Round 3: Drop the loop from your hook, hold the elastic against your first dc row. Fold the bottom dc row around the elastic. Insert your hook through the loop that is in front of your joining loop from the previous round, pick up the dropped loop and pull it through. Ch 1, sc through both layers matching the loops around, enclosing the elastic Join wiith a slipstitch in first sc. Attach yarn with a sc in the slipstitch row. 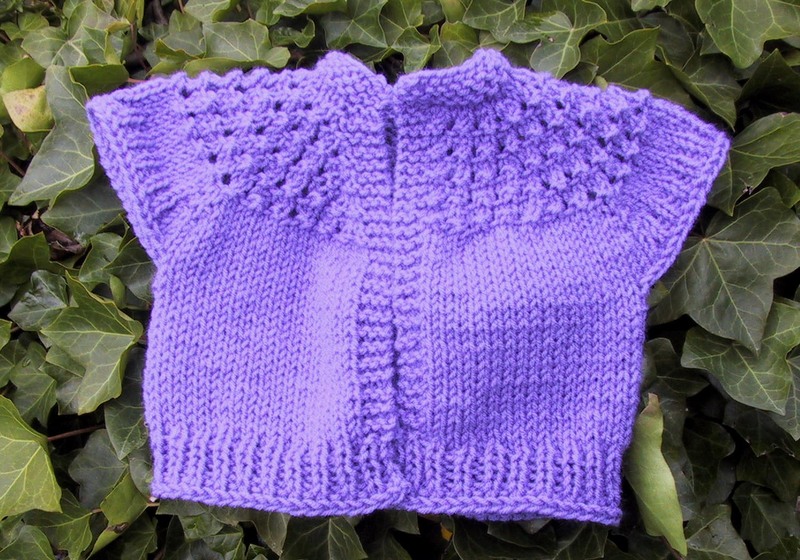 Thanks, Viginia for testing this pattern. 2. I used a 29 inch circular needle. 3. Vest in photo was knit with Red Heart Super Saver Lavender. Note Always keep first and last 3 stitches in knit even on a purl row. K1, M1, K5, M1, K5, M1, K6 (20 sts for other front). Row 29: K3, P to last 3 sts, K3. Row 30: Knit across row, increasing 1 st before and after each marker. (139 sts). Row 31: K3, P to last 3 sts, K3. Thanks Virginia for testing this pattern. 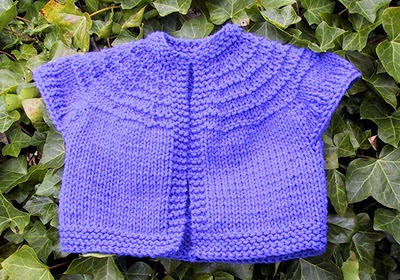 Inc 1 st in next st: Knit into front and back of that stitch. 2. 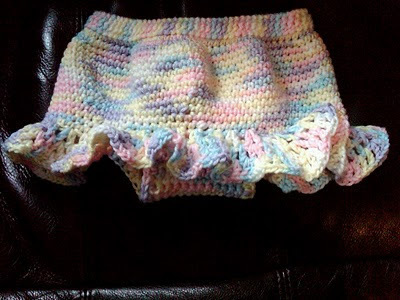 I used a 29 inch circular needle and Red Heart Super Saver Blue.